We are moving slower and slower every morning but when the boys said that breakfast was over at 9, we started moving pretty quickly. They had gone in the hotel with Robby when he checked in and were sure the delicious Holiday Inn Express breakfasts ended at 9. Robby took all of the kids after they were all ready and then I showered and Whitman and I came down to breakfast. We ended up having plenty of time since breakfast wasn't over until 9:30! We then loaded up and headed back downtown for a walk along Main Street. Our first stop was Opie's Candy Store and every picked out 3 peices of candy and Robby and I picked out some fudge! Then we walked into Floyd's barber shop. An old man that used to cut Andy Griffith's hair was there so we took our picture with him. Back down the road a little more and we stopped at Wally's service station for an ornament and some bottles of coke to enjoy in front of the jail. The town was so incredibly quaint-Robby and I even talked of moving there and running Wally's service station when we retire. I will run the gift shop and he can give the tours in Andy's squad car. The tour was taking guests to the largest open face granite quarry just like we saw last night. After the kids were all sugared up on their bottes of RC, root beer and everything else (Robby just bought one of each so everyone could try every drink) we hoped back in the car and headed down the road to Blowing Rock. We stopped in Boone for a bit to find the house Grannymom and her friends are renting this fall. First we drove down a street and saw the number but couldn't see the house. So we drove up the steep narrow driveway to find the house but we still couldn't see the house. It took a bit to manuever backing up down the driveway and when we had made it, Robby realized that we had found the wrong address. It wasn't too far to find the real house that Grannymom would be staying out but as we were trying to get out of the neighborhood, we almost traversed up a golf path! Thankfully, we made it back to the main roads without falling down a cliff or running over any golfers! From there, we headed to Grandfather Mountain off of the Blueridge Parkway. The admission fee was pretty hefty but the first stop we made was a picnic stop and it was the best picnic stop we have had all trip. The kids played football and climbed on rocks while we ate. They loved it and after a bit of climbing and playing they were ready to get back into the car. Up the hill a little way were two huge rocks that everyone but Whitman climbed on. Keaton was going to have to stay down with me and Whitman but a man offered to lift her up to Robby. Whitman stayed down with me and if I would have let him, he would have been to the top of that rock in a second. At one point, I put him on a rock to take a picture and the next thing I knew he was climbing up the rock and I had to quickly put my camera down and climb up a step to grab him by the shirt before he climbed out of my reach. The others climbed to the top of the rock and were happy for me to take their pictures. When everyone finally climbed down, we headed down the road to see a bear, otter and an eagle. Then it was try out the ice cream and fudge store. We all had ice cream overlooking the mountains. Next up was the drive to the top of the mountain. 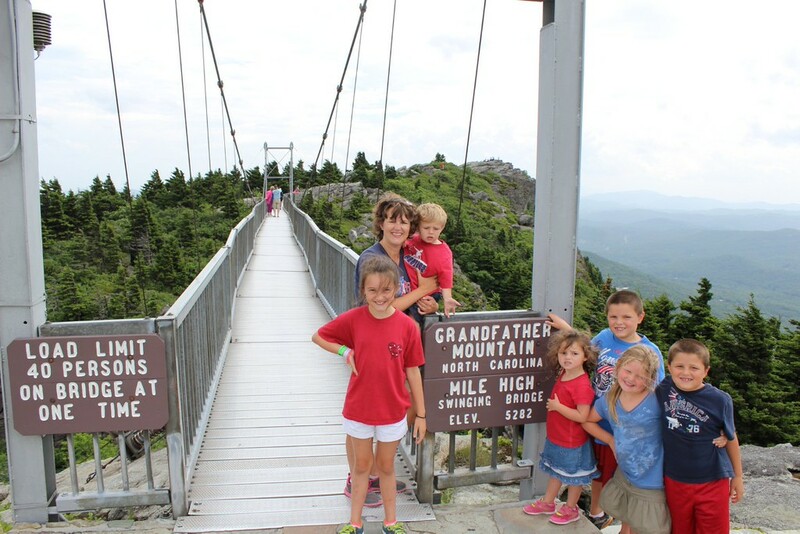 There is a seen in Forest Gump where Gump ran on the hair pin curves of Grandfather Mountain and we drove up that to reach the swinging bridge. The bridge is a mile high (a mile above sea level) and you can definitely feel the swing of the wind. The highest recorded temperature from the top of the mountain was 83 and the wind gust have reached 120 miles per hour up there. After we crossed the bridge, Robby ran down to the walking trail under the bridge to take some pictures. Then Whitman and I went to the gift shop as Robby and everyone else walked down the .4 mile trail down to another parking lot. That meant that I had to drive down some of those hair pin curves in a lower gear (I had never driven using a lower gear before). Our stop at the gift shop had taken a bit and when we made it to the bottom, I expected to the kids and Robby to be there. They were not so Whitman and I started up the trail. We walked for a bit and then we started hearing them. Robby was making them take turns being the leader on the trail and then 2 skinned knees slowed them down a bit. Eventually the kids saw Whitman climbing up to meet them and we all climbed down the trail together. It took no time at all to come down the mountain and we again traveled the back roads to our next destination, Blowing Rock. This GPS has it out for us-she wanted us to turn down a gravel road once. We declined and it took her forever to calm down and find a more traveled path to Blowing Rock. We drove up and down the main street at Blowing Rock. I could just imagine the characters of the Mitford series walking up and down the streets. We found the Episcapalian church-maybe Robby and I should move here and do some Mitford series and Father Tim tours. Robby did run into the Mast General store for a bit to check it out and then we were back on the road headed to see Nonna and Pops. At this point in our drive, I thought that the dangerous roads were over but I was wrong-crazy driving up here in the mountains. I just don't understand how people end up living on the side of a mountain. We thought that we would never get out of the mountains. Robby didn't seem too concerned withi his gas level even though the gas light was on. He actually seemed more concerned with getting my crew supper. I eventually passed out crackers in hopes that I could keep everyone happy until we found a food place. Back to the GPS, not only does she have it out for us but she must have it out for our children. I guess she was trying to make sure that at least one of them became car sick. Robby was flying up and down the mountain taking some curves on 2 wheels (or so it seemed) so he wasn't helping any. So I did all that I could to prevent car sickness-turning the air up on full blast. By the time we finally did stop, Campbell was wearing her jacket and kids were covered up in towels and shivering. But we were successful and everyone survived the trip up and down the mountain! When we finally found a found stop (Dairy Queen) we all went inside to potty and then I took all the kids except Anderson back to the car, while he and Robby waited on our order. Since we went on the Ford F 150 factory tour, Graham is quick to notice Ford trucks. He saw one F 150 in front of us and another one beside us. Graham was eager to tell everyone about what he spotted "There's two "F"ers." Um, excuse me? I said "Let's don't say it that way" staying calm. Then Campbell shouted "F"ers? What's "F"ers?" I then was quick to say "Oh, look here is Daddy with our food." By the time Robby made it to the car, I was trying not to laugh so much that I was almost in tears. I certainly hope that whole conversation doesn't come up again! From our supper stop, we just had a little over an hour before we arrived at our hotel for the evening. Nonna and Pops had been waiting on us for hours and hours-well, maybe they weren't just waiting on us since they had been out shopping and eating. All the kids were so excited to see them but Whitman could not get out of the car fast enough to get to Pops. The kids went to Nonna and Pops' room while Robby and I unloaded-of course, Whitman's trains went with him (if he has his trains then he is usually quiet) Then we visited for a few minutes before we put the boys to bed in Nonna's room and the girls to bed in our room. Tomorrow will be a busy day even though we just don't know what all we will do yet!